Remember in December of 2008, when I wrote about helping sea turtles on a beach in Costa Rica? Well, a few of the nights I worked, as I hiked back to camp through a thick stand of rainforest, I happened to observe some small rodents named Vesper rats eating fruit in a palm tree. 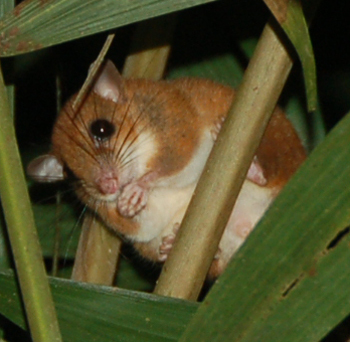 It turned out nobody knew Vesper rats ate palm fruits and, after some additional research, this little discovery led to the writing of a scientific note, “First report of Vesper rat, Nyctomys sumicrasti (Rodentia: Muridae) feeding on Palm fruits”. The short communication, which I co-authored with my biologist friend Guido Saborío, was recently published in the peer-reviewed journal Brenesia: http://www.osaconservation.org/ScienceReports/2009_Bessesen_Vesper_Rat.pdf . This entry was posted in Costa Rica Adventures, Life as an Author-Illustrator. Bookmark the permalink.